Can we count on the river flows of the past to predict the future? For 96 years of the 20th century [1900-1995], the Truckee River flowed an average of 579,000 acre-feet (at Vista near the Truckee Meadows Waste Water Plant). That average number represents a continuous flow of 800 cubic feet per second (CFS). Our measurements of flow during the last century, of course, were made after many changes had already taken place in the Truckee River watershed. 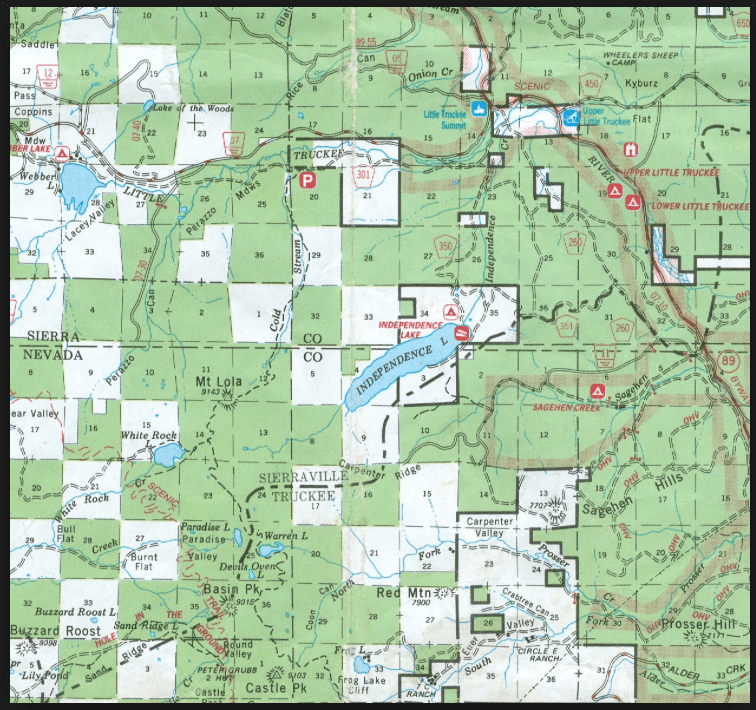 A dam was already in place at Lake Tahoe and a large network of ditches, dikes, and diversions from the river were already in place throughout the Truckee Meadows and Washoe Valley. And the nation’s first reclamation project was constructed between 1905 and 1917. Today, however, the changes that are occurring to our river may go well beyond ditches, dams, and diversions. The watershed is seeing an increase in temperature that may be unprecedented in thousands of years. Higher temperatures will very likely lead to greater evaporation and less snow. That leads us to ask: What is the chance that we’ll see an average Truckee River flow of 579,000 acre-feet in the remaining 86 years of the 21st century? 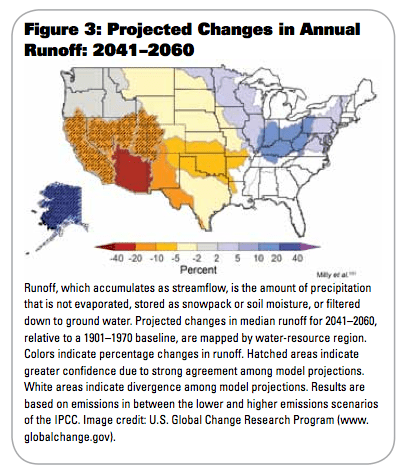 Some studies are saying that the entire west – not just the far southwest dependent on the Colorado River – are facing a moderate to serious drop in precipitation coupled with increasing temperatures that may result in streamflows dropping by as much as 25%. What worries many is that the decrease in river flows may have already started. 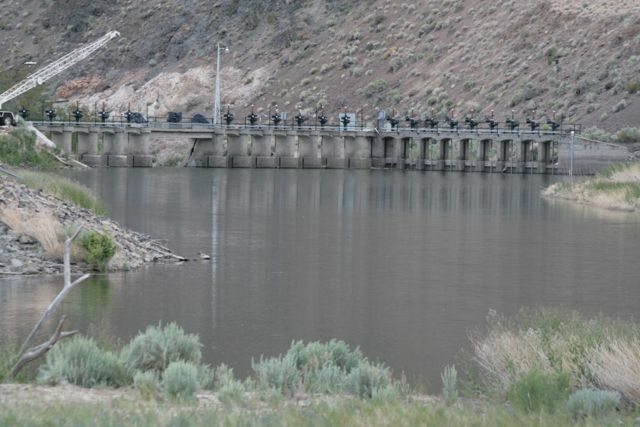 The Truckee River has already seen 14 years of “abnormal” dry conditions with only 2 years in that time frame seeing above average precipitation. Drier than average conditions mean that water for Truckee River flows into Pyramid Lake are inadequate to keep up with natural evaporation rates. Much of the worry about dry conditions has focused on the Colorado River and more recently on California. In an article in “The Week” (theweek.com) the headline reads “The unprecedented water crisis in the American Southwest”, which focuses on the Colorado River. Scientists are increasingly sounding the alarm of drying conditions affecting all who depend on the Colorado River. “We can’t depend on history to project the future anymore,” said Carly Jerla, a geological hydrologist who closely monitors the Colorado. 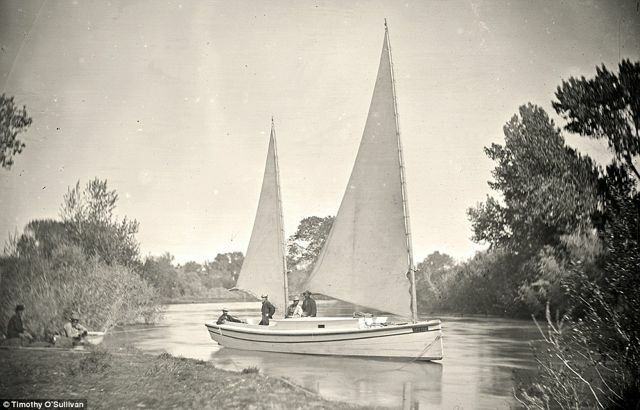 The river’s wet 20th century may have been an anomaly; in the 13 centuries before the 1900s, its flow was actually 15 percent lower. The current drought may also be the product of a wider pattern of climate change, signifying a barren future: Several global-warming studies predict that rising temperatures will reduce the river’s flow by up to 35 percent by 2050. 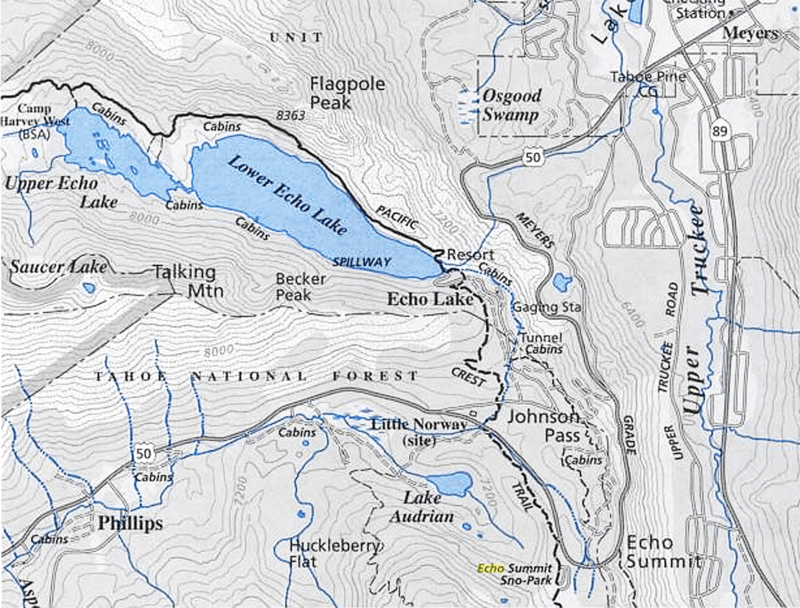 The Derby Dam diverts Truckee River water from its natural course which goes to Pyramid Lake. Instead water flows into the Truckee Canal to the Carson River. who reside in the west’s Mega-cities like Las Vegas, Los Angeles, and Phoenix. But every westerner faces an uncertain future if there is a shift even half as great as 25-35% declines in stream flow. The Truckee River is critical to the Truckee Meadows and a decline of such proportion would be devastating to the people and wildlife of the entire region. Can we conserve 35% of all water use? Agriculture? Urban? Industrial? Can natural systems at Lake Tahoe and Pyramid Lake and the length of the Truckee River survive with a smaller fraction of our left-over water? This entry was posted in Keep it flowing on March 26, 2014 by Dennis Ghiglieri. The Truckee River in the high cold Great Basin Desert seems an unlikely place for rare birds to appear. But in the last five years, the River has hosted four birds that made the regional Rare Bird Alert lists. 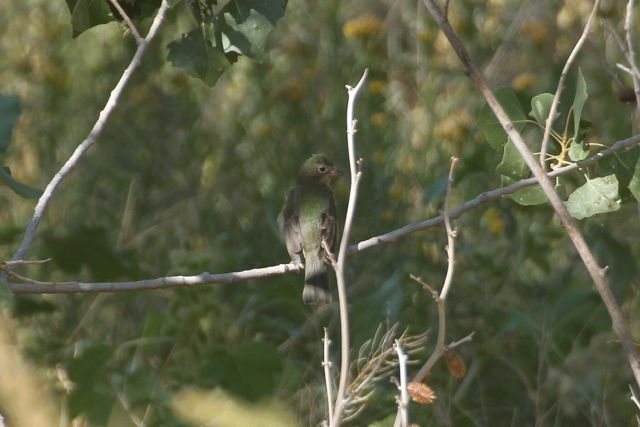 Most recently, Greg Scyphers found two quite rare birds in the riparian forests in the Truckee Canyon. Last fall, a female Painted Bunting was discovered hiding next to a little oxbow pond in one of the lower river restoration areas created by The Nature Conservancy. A beautiful multi-colored sight in the lower mid-western states, the bird is rated as a “casual” fall visitor to the West. Earlier last spring, a Yellow-throated Vireo which is common in its far eastern US range showed up in a patch of riparian forest. 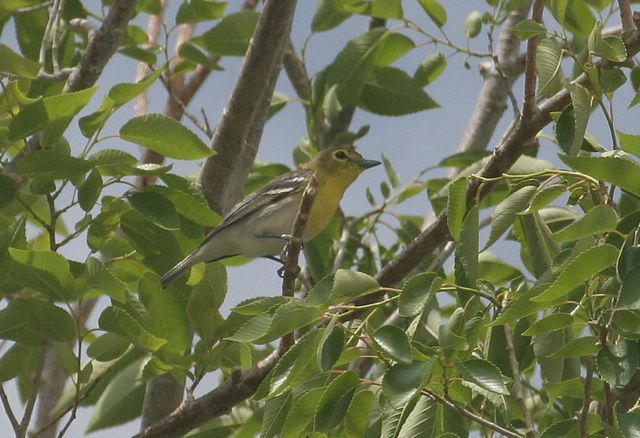 Catching a glimpse of this bright yellow vireo flying between willows and cottonwoods was a challenge, but all viewers enjoyed its distinctive song. 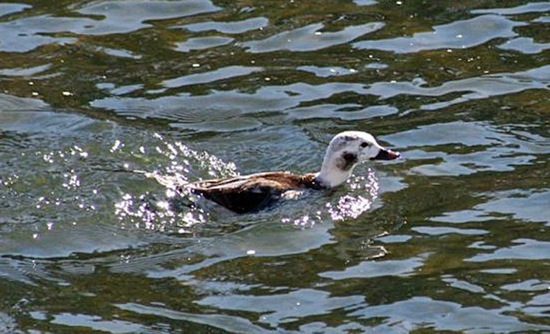 A Long-tailed Duck (AKA Oldsquaw) graced the Truckee River in downtown Reno during the winter of 2010/11, diving and swimming underwater for its meals. This duck usually winters off the west coast and breeds by ponds in the far-northern tundra. 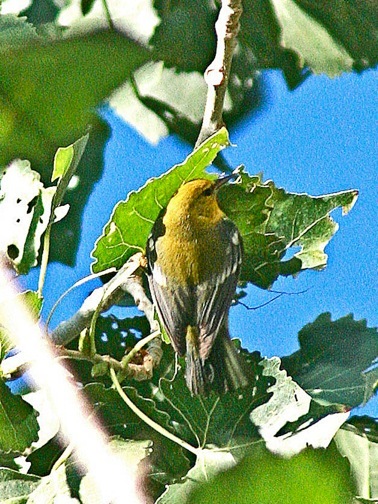 An even rarer Eastern warbler showed up in the fall of 2009 in another restoration area along the lower Truckee River – a Blue-winged Warbler. This brightly colored warbler lives east of the great plains in brushy meadows and is considered a “vagrant” to the West. Historically, rare Black and White, Tennessee, Black-throated Blue, and Blackpoll Warblers, American Redstarts, a Harlequin Duck, and a Pacific Loon have been found by birders in the river or in the river trees. Resident birds and seasonal river visitors include the American Dipper (AKA Water Ouzel), Hooded Mergansers, Barrow’s Goldeneyes, Northern Pygmy Owls, and Bullock’s Orioles. The Truckee River continues to attract flocks of birders who enjoy both the rare and the resident birds. Do you know of any other rare birds on the Truckee River? I look forward to hearing about other avian gems along our river! This entry was posted in Fish and Wildlife, Keep it flowing, River Restoration on March 18, 2014 by Rose Strickland. Oh No! Pipe Lake Tahoe water to Sacramento? That question was just fielded by the Sacramento Bee in a recent question and answer column. And it’s not for the first time either. Lake Tahoe, because of its immense size and depth, has been a target of water interests in California since the 19th century when tunnels through the Sierra were considered to tap the Lake and its water. The Sacramento Bee does a credible job of answering the question (forget it, basically), but the large population in California (38 million people and rising) is a constant threat to water resources statewide. Today, waters of the Truckee River (which includes all of the Lake Tahoe basin), are used in both California and Nevada. 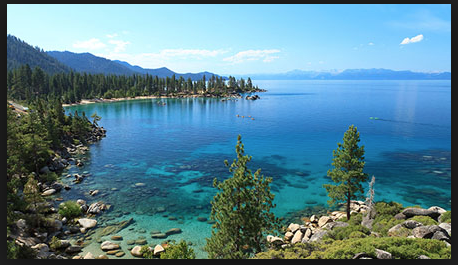 Lake Tahoe is over 1,600 feet deep and contains a vast amount of fresh water, but has a very small watershed. Most folks don’t realize that water from the Lake Tahoe basin already goes into a river that flows west to the Sacramento and eventually to the Pacific Ocean. Late in the 19th and early 20th century, diversions of streams flowing to Lake Tahoe or to the Truckee River directly were constructed and still operate today. Echo Lake Water is diverted to the American River by PG&E. One of the diversions most everyone eventually drives past if they live anywhere in northern Nevada or California is at Echo Lakes at Echo Pass on US Highway 50. (Click on the map to see a larger version). A dam on the lake provides 12 feet of storage that PG&E sends through a tunnel and pipeline to the American River to the west. If the water followed its natural course it would flow to the Upper Truckee River, Lake Tahoe, and to the Truckee River. Independence Lake itself is a natural lake, but has a small dam. Some of the water stored by the dam is owned by the Truckee Meadows Water Authority to supply the Reno-Sparks area during long-term drought. So, in most conditions less water flows into the Truckee River because of the diversion to the Feather River and the storage of water in Independence Lake. These two diversions to California have operated for so long that most people don’t realize that water from both Lake Tahoe and the Truckee River already flows into west flowing American and Feather Rivers, through Sacramento and on to the Pacific Ocean. Each takes water permanently away from the much smaller Truckee River. This entry was posted in Keep it flowing on March 9, 2014 by Dennis Ghiglieri.